After the successful run of its stage play, “Walang Kukurap”, Tanghalang Pilipino (TP) pays tribute to the stage artists of yesteryears through its 3rd theater season offering entitled “Stageshow”, a grand musical play slated on October 10-21, 2012, 3pm and 8pm, at the Cultural Center of the Philippines’ Tanghalang Aurelio Tolentino (CCP Little Theater) . 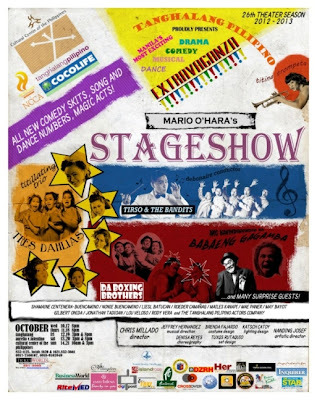 Written by the late veteran TV, film, and theatre actor, director-playwright Mario O’Hara, Stageshow is a poignant and emotionally charged play which focuses on the plight of a small group of dedicated Filipino artists during the twilight years of their careers. The play also takes us into a glimpse of a lost era in Philippine cultural history-the stageshows called the bodabil and where these artists are torn between their love for the art and economic survival. The play also touches on the reality that the torch-bearers of any culture are its artists and the tendency to discard the old for the new often comes at the expensive and irreparable cost of losing one’s soul. Adapted from the American ‘vaudeville’, bodabil was a popular entertainment genre from 1920s to mid-‘60s, which spawned legendary talents like Dolphy, Bayani Casimiro, Rogelio dela Rosa, German Moreno, Sylvia La Torre, Pilita Corrales, Elizabeth Ramsey, Oscar Obligacion, Chichay, the tandem of Pugo and Tugo, among others. It featured a hodgepodge of musical numbers, short-form comedy and dramatic skits, often staged inside the theatres of Manila. “The play captures the essence of the people behind a stageshow,” says Fernando “Tata Nanding” Josef, TP’s artistic director. Tata Nanding divulged that Mario O’Hara wanted to illustrate how these stage shows and their artists evolved from popularity to obscurity. Mario O’Hara’s Stageshow topbills the talent and versatility of TP veterans–stage/film/TV actors Shamaine Centenera-Buencamino and Nonie Buencamino, with Liesl Batucan and Roeder Camañag who will act as alternates. Joining the cast are Angelina Kanapi, Mae Paner, May Bayot de Castro, Rayna Reyes, Rody Vera, Lou Veloso, Gie Onida, Pam Hundana, Gino Ramirez, Jonathan Tadioan, April Iñigo, Tara Cabaero, Hazel Maranan, Kaye Garcia, Agnes Sarreal, Anthony Falcon and Aaron Ching. Directed by Chris Millado, Tanghalang Pilipino will also honor these stageshow artists in a “Gabi ng Pagkilala sa mga Beterano ng Stageshow” on October 13, 2012. The play is also an official entry to the National Theater Festival in November. Production staff also includes Jeffrey Hernandez (composer/arranger/musical director), Denisa Reyes (choreographer), Tuxqs Rutaquio (set designer), Brenda Fajardo (costume designer), Katsch Catoy (lights designer/technical director), TJ Ramos (sound engineer), King Catoy (videographer), Mia Bolaños (vocal coach), Tony Casimiro (tap dance instructor) and Yette Valenzuela (hair and make-up designer). For ticket reservations, group sales, sponsorships, and special performances, please contact Ms. Cherry Bong Edralin at 0917-750-0107 / 0918-959-3949, 832-1125 local 1620/1621. Tickets are also available at Ticketworld at 891-9999 and at the CCP Box Office. Visit the official TP website at www.tanghalangpilipino.org.ph for other information.